Israel’s Prime Minister Benjamin Netanyahu Monday few hours after announcing a deal with the UN refugee agency to allow over 16,000 African migrants to stay temporarily in Israel made a U-turn announcing that he was ‘for the time being suspending the agreement’, Times of Israel reports. “I hear you, and especially the residents of south Tel Aviv,” Netanyahu said in Hebrew, in a facebook post. “For the time being, I am suspending the agreement,” he added. Earlier in the day, the Israeli leader announced an agreement with the UN refugee agency allowing the deportation of some 16,250 African migrants to third countries, rumored to be Canada, Germany, Italy, the United States or Sweden. Under the deal, a similar number of African migrants were to get a temporary status in Israel and be relocated in other regions of the Jewish state. The about-face came following criticism in his own camp and from anti-migrants groups following the deal with UN, Times of the Israel reports. 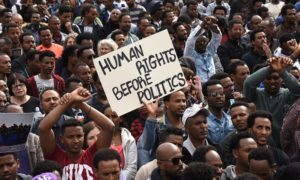 Tel Aviv had unveiled late last year its anti-migrant plan to deport 42,000 African migrants, largely stemming from Sudan and Eritrea, to Uganda and Rwanda. Some who were deported to the two African countries and offered $3,500 and flight ticket told the Israeli media that they faced serious danger and even imprisonment after arriving in Africa without proper documents. Last month, the Supreme Court froze the plan, deeming it illegal. The UN also criticized the plan and entered into a deal with Israel for a five-year scheme. Netanyahu backed the anti-African-migrants sentiment as he recently noted that African migrants are more dangerous than jihadists. Rwanda Tuesday told Israel’s Kan public broadcaster that it has never entered into any agreement with Tel Aviv to take in African migrants. “There was never a deal with Israel, neither in writing, nor verbally,” said the African country’s foreign Affairs minister Olivier Nduhungirehe. The Rwandan official denied Netanyahu’s comments that Rwanda accepted to play the role of third country. also noted that Kigali backed out of the agreement after being on mounting pressure from the European Union and the New Israel Fund. Posted by Khalid Al Mouahidi on April 3, 2018. Filed under Zoom. You can follow any responses to this entry through the RSS 2.0. Both comments and pings are currently closed.